My obsession with maxi dresses continues. Well I wouldn't really say its an obsession but more of fascination. I really do love wearing maxi dresses, they are great for many occasions. 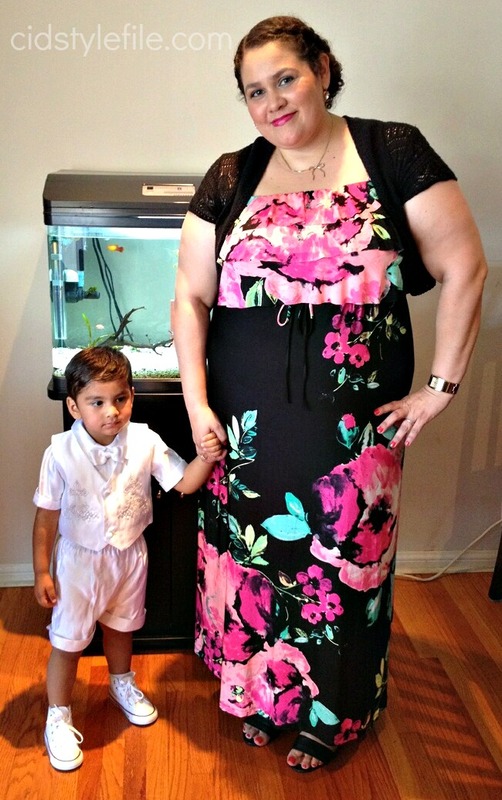 This past weekend I wore another maxi dress for my nephews baptism. I was chosen to be his god-mother, which is a honor and blessing for me, since his mom is also my god-daughter. His mom knows what a great god-mother I am and she wanted the same for her son. Sorry had to toot my own horn for a bit. We had a small simple ceremony and party afterwards to celebrate. I don't have many pictures of me and him or the outfit. It was a hot day and he was all over the place. The picture below is the only one I got with him, right after I dressed him for the baptism. It was a hot day and the dress kept me cool and comfy, for the entire day. I'm with my god-son Aries, this is the only picture he stood still for the entire day. Aries was a little angle in his white outfit (doesn't he look cute with the white converse) The white high top converse was my idea! I love the versatility of maxi dresses, for all occasions they can make you look great. I wore this floral maxi dress from Style & Co found at Macy's. The print and ruffle detail caught my attention at the store. Once I tried it on, I knew this was the the dress. It fit and felt great, perfect for this occasion It was the first dress I tried on when shopping for the baptism. Over all I was happy with the look, got my hair braided at a salon across the street from my apt. I wanted a nice summer look that was a little more dressy than your everyday casual maxi. The makeup I used was from the Estee Lauder Bronze Goddess collection to finish off my entire look. So what do you think of my look? Are you loving maxi dresses as much as I do? I love this floral maxi dress on you! You look amazing and I love the ruffle detailing in the dress! Sounds like you had a wonderful day and I can see that you're a great God-Mom because you're an AMAZING WOMAN!!! I do love maxi dresses and this dress is adorable on you... I think they are the perfect dress for anytime of the year even though it is mostly used in Summer/Spring months. I agree they are very versatile. I resisted at first, but now I really like them! That is a pretty dress that you have on!Love the colors!